Much of what you teach about patient flow is transferrable to the primary care setting, but the average GP is still very much overburdened. Is there anything specific you have in mind that would allow GPs to optimise their work? Yes GPs, and secondary doctors, all feel overburdened. They confuse demand with WIP – work in progress. So, the first task is to remind them the principles of physiology (flow) through any system: demand (flow in), activity (flow out), work-in-progress is the cumulative difference between the demand and the activity. So, if average demand > average activity over time, then the work in progress will build, but this is not the only reason why WIP will build (see later). Then finally the lead time is the time from when a patient presents to the system as a demand, to the time they leave the system as an activity. The relationship between flow (demand, activity), WIP and Lead time is governed by Little’s Law. if you plan your flow capacity i.e. the man-hours that the staff are available based on the average demand, then you will get a queue. This is a fundamental to any System and was described by Erlang over 100 years ago. b) Patients now have to game the system to get in. 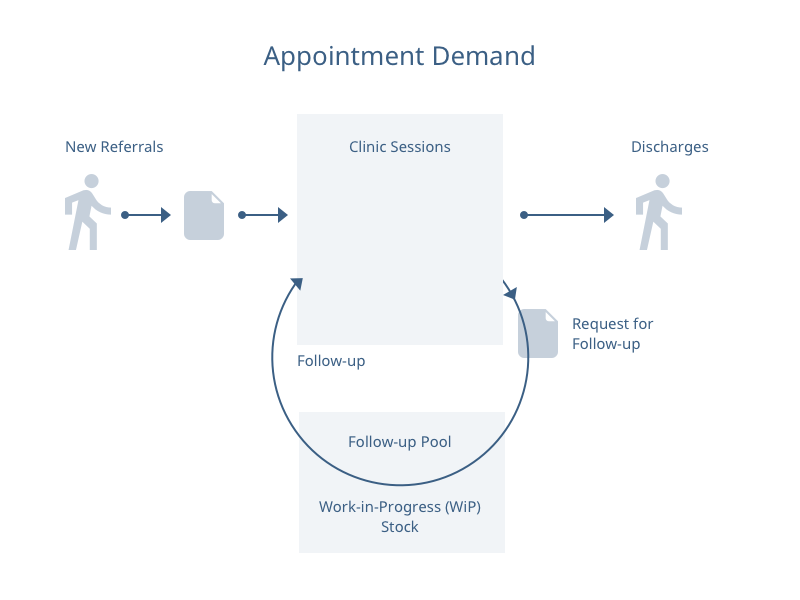 This causes the demand to increase from rework demand: patients making several requests to get it, or institutional demand – GPs not completing the task in one sitting and asking patients to come back ‘when I am less busy’. So, it is vital that GPs measure their demand, cycle time and workload to make the diagnosis: Have they confused WIP for demand? Is the WIP due to a flow capacity constraint or the inadvertent complication of their ‘demand management’ policies? Are there any ways in which you think digital health solutions could play a part in the improvement of patient flow, thus making a better staff and patient experience? Only where the digital solution addresses a fundamental problem: i.e. Reducing the lead time (waiting time) for a task to be performed. In my experience, digital technologies are misapplied so they do none of these. A good example of this is telephone consultations in general practice. GPs put telephone consultation into their operations in the belief that it reduces cycle time. They just ‘carve out’ some of their appointments and make them ‘telephone consultation’ appointments: patients still have to book them and receptionists still have to ’guess’ if a telephone consultation is appropriate. The telephone technology in this context makes no difference and actually makes the system worse because the policy of dividing up appointments into face to face and telephone consultations makes the flow constraint worse. the telephone technology allows GPs to contact every patient who calls in each day and define exactly what each patient needs. 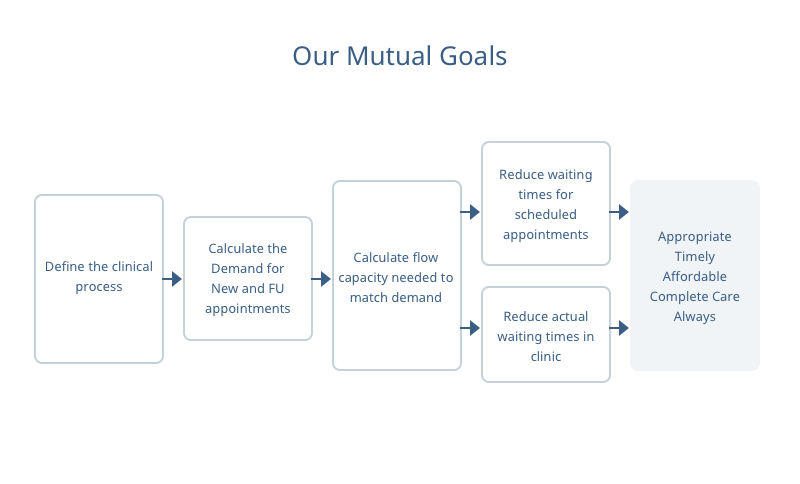 In this case 65 to 70% of patients have their problems resolved on the telephone in 6 minutes rather than 10 minutes it would take to see them, and a GP can recognise within 3 minutes when a patient’s problem can’t be resolved and on the phone and they need to be seen. This frees up flow capacity for the GPs and eliminates the WIP and stress. In this case the telephone technology improves the yield for both patients and doctors, reduces the cycle time for doctors and reduces the lead time for patients (win-win). A similar argument applies to online consultations – they only work if the GPs have designed their operations to respond to the e-consultations in real time. In my experience, they haven’t.